This Disney Princesses mural was painted by hand, directly on to all of the walls in this room, and over the fitted castle. At the time this hand painted mural, painted over the whole room including a fitted castle (installed previously), cost the client £2000, and any similar work would be quoted about the same. 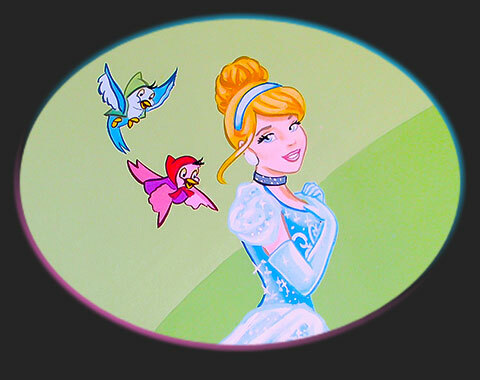 Delightful Disney Princesses mural hand painted in a fabulous girl's bedroom. The commission included painting a fully fitted castle that was built by a carpenter, and was very practical as it contained a bed, playspace underneath, storage with pretty shelving, a wardrobe, and drawers hidden in the stairs. I can put you in touch with the carpenter who built this if you would like something similar. Every part of this room was painted over two weeks, the Disney characters were treated with a lot of care and attention to detail, and the background design and colours, chosen by the client, work well to create a light and fun room that feels at once both playful, and gentle. Fitted Castle in Girl's Bedroom, painted pretty colours with it's own view out of the arched "windows" to a fantasy kingdom. Shot showing part of the room layout, please ignore the obstruction! At the time this hand painted mural, painted over the whole room including a fitted castle (installed previously), cost the client £2000, and any similar work would be quoted about the same. Of course you may qualify for a discount.